‘The Media’ is the medium (TV, radio, internet, etc.) through which information is transferred from its producers to consumers. For this article, I’m going to focus primarily on internet journalism in the post-2013 era, and how it applies to the alt-right. Understanding internet journalism and its rules, trends, and how it has evolved, can improve the success of spreading content to consumers. But second, the media doesn’t just inform: it can change existing narratives or create new ones, either subliminally or blatantly. The latter has the potential to be very powerful. The word ‘propaganda’ has negative connotations, but what it really is is just effective communication, which by definition reaches a lot of people and changes minds. , it is absolutely necessary to adopt a variant of the principle of Ronald Reagan, which is no enemies on the Right. A tendency to delicately recoil from anyone willing to articulate, let alone actually fight for, their own people’s interests is one of the fatal flaws of conservatism, which at its core is little more than an aesthetic philosophy of noble defeat. Guilt by association is real – it’s a tough sell making Daily Stormer articles go viral outside of the white nationalist community – not because the articles are wrong or poorly written – but because many people (even those who may agree with parts of the content) don’t wish to be associated (for fear of the very real social consequences) with white nationalism, or as Vox Day calls those people. Scott’s success is also symptomatic or emblematic of a tectonic shift in online media and journalism from sensationalism and partisanship that was characteristic the pre-2013 era, to post-2013 era of centrism, ‘long form’ journalism, and rationalism, filling an insatiable demand by millions of smart, young people, especially since 2013, for the unvarnished, unmolested truth instead of pleasantries wrapped in a pretty bow of political correctness. But at the same time, millennials have also become impervious to sales pitches, hype, and demagoguery. The former is still popular, but in terms of getting monster page views and viralness, the latter is winning hands-down. 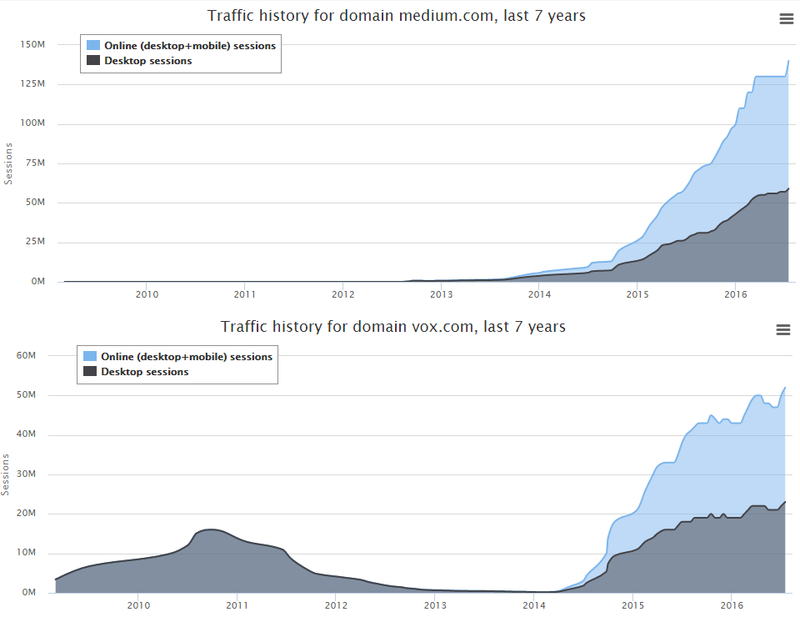 Look at Vox…launched in early 2014, now one of the biggest and most influential ‘news’ sites out right now, if not the biggest. What Vox did was abandon the old, pre-2013 style of journalism (dry expository articles, terse articles, AP-news regurgitation, shrill partisan rants) and instead: use of data visualizations, graphics (such as charts), cartoons, long-form, extensive hyperlinking, extensive data and facts, and a conversational writing tone, to appeal to a hipper, savvier demographic (and in anticipation of changing sentiment and reader tastes, as explained in Solvent), and this strategy paid off big, as virtually all Vox articles go hugely viral. WaitButWhy is another example…again, lots of data, and of course the cartoons. Also the ‘shared narratives‘ pop up in both sites, instead of politics and ‘culture war’ stuff. But most importantly, for stuff to go viral in a post-2013 era and be read by millions, it has to be smart (data visualizations, introspectiveness, shared narratives, nuance, etc.). But second, it has to avoid the problem of guilt by association, the latter which plagues a lot of the alt-right and sites like Daily Stormer. Another example, and how this could apply to the alt-right, is many months ago an article went hugely viral on Reddit that used data visualizations to show how women tend to major in low-IQ subjects. Given that the article received thousands of up-votes on a default sub, it easily hit the front page, where it stayed presumably for half a day, at least. The traffic must have been immense. For example, I had an article about fake Amazon Book Reviews go viral on r/books (a default sub), which lead to 50,000 unique page views that day before the mods ignominiously deleted it. But it only had 200 up-votes and was only up for six hours, a far cry from thousands of votes, and yet it still generated a ton of traffic, so I can imagine that for the other article it must have been a million unique views (which is probably more traffic than 99% of alt-right blogs combined). The use of nuance and data visualizations (post-2013 style), as well as the site being non-political, is what allowed the article to go so viral, exposing millions to HBD that would have otherwise remained oblivious or misinformed. Had Daily Stormer written that exact same article it would have never gone so viral, because of the association with white supremacy. Nor if National Review had written it (because National Review is seen as too partisan and is full of journalist hacks, not scientists). A common misconception is that political correctness prevents certain content from going viral, and perhaps there is some truth to that, but I think guilt by association is more problematic than censorship due to political correctness. The fact that the article about gender, IQ, and college majors went so viral is evidence there is huge demand and open-mindedness for politically incorrect information, but it needs to be presented correctly, in a palatable form, to have the maximum effect. Now imagine a right-wing version of Vox, Medium, SlateStarCodex, or WaitButWhy and how effective that would be. The AEI is sorta like that (with its Charles Murray articles) but they tend to focus too much on politics (very little HBD), too partisan (Charles Murray, although he does good work, has too much baggage), and there are no data visualizations. So why don’t I do it? Maybe I already am. You’ll never know. That’s the point…it is supposed to be subversive, but importantly, not involve ‘big names’ with baggage, partisanship, opinions, and egos – just let the data speak for itself.